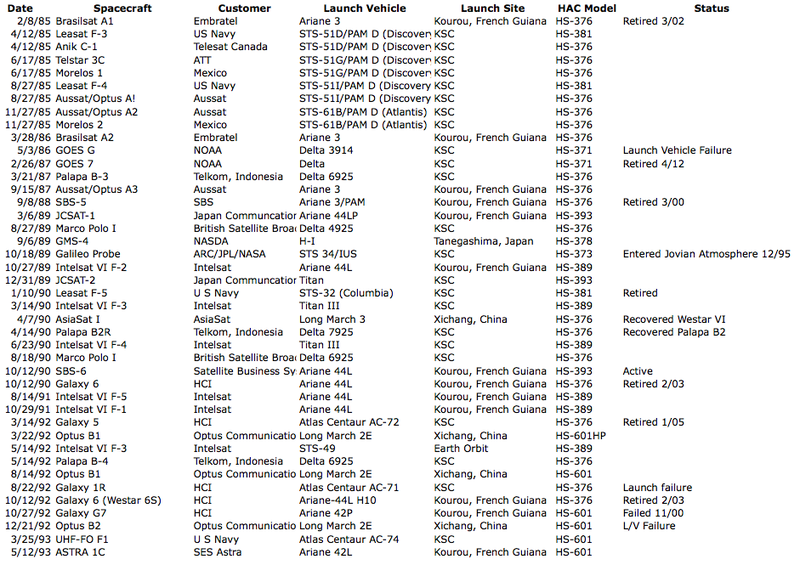 This is a compilation of all unclassified Hughes Aircraft launches from the first launch of Syncom in 1963 through the calendar year 2000 in chronological order. It is a work in progress and I solicit inputs and corrections from all. 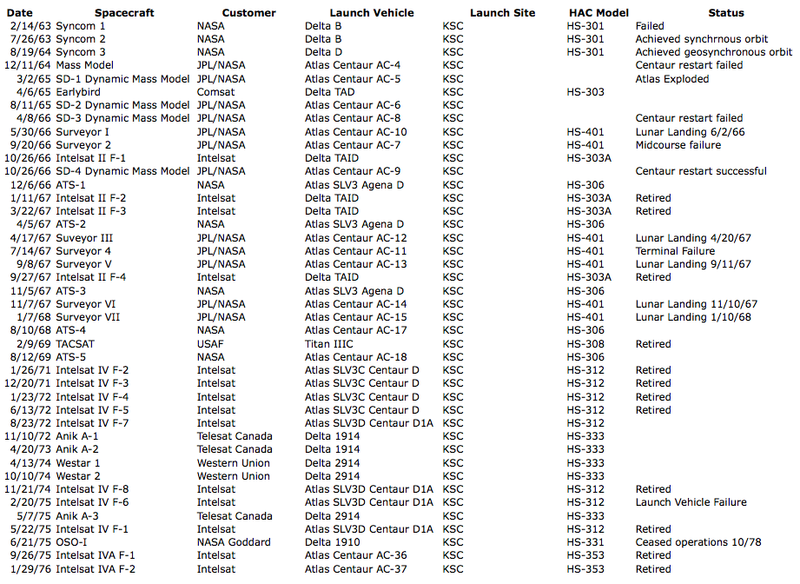 I believe that I have included every unclassified launch and only status data is needed. I have added the three HS-376HP launches that were conducted by Boeing 2000-2003. Please review this and help me add to our log. I was involved in the founding, development and operation of SATELCO. 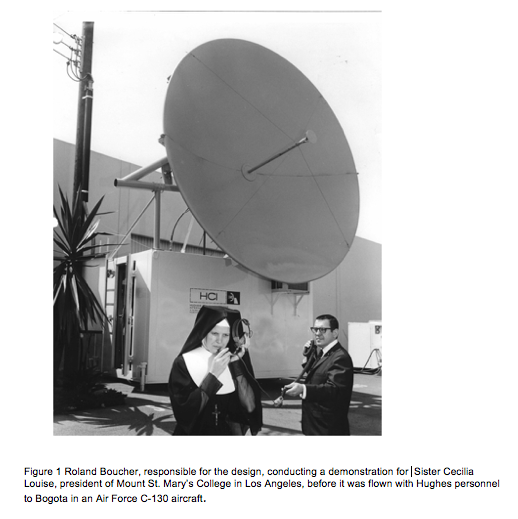 It was an exciting period in the quasi-commercial implementation of international satellite communications. I have been asked by longtime friend Boris Subbotin to share my experience with others interested in the extraordinary days of Hughes Aircraft Company. What follows is my recollection of the people, the events and the dates of the activities. I hope I have acknowledged the contributions of the contributors, identified the events that shaped SATELCO, and I hope the dates approximate the times of the episodes. The success of the Syncom satellite built by a talented and dedicated group of people under the guidance of Dr. Harold Rosen in the Space Systems Division, stimulated many ideas, to promote the development of geosynchronous satellite systems for the betterment of mankind. One of those ideas was the formation of the Hughes/NEC Satellite Telecommunications Company, (SATELCO). The following paragraphs tell the story of its formation and eventual demise as I remember and includes edit comments from Joe Moore. Comments from others that might remember other details of this amazing chapter in the life of the SATELCO story are always welcome. In the 1960’s the United States and the USSR were engaged in a cold war and a war of words on the benefits of a capitalistic society versus a communistic society. 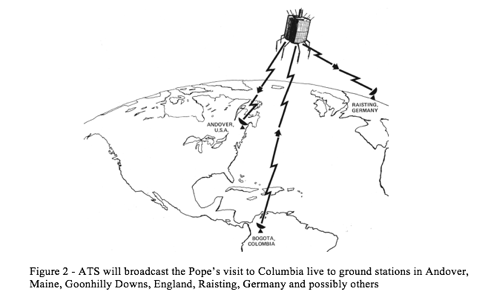 Offering global communication connectivity via a U. S. designed satellite system was a means by which President Kennedy could demonstrate the advantages and benefits of a capitalistic system to the world. The U. S. State Department was empowered to develop a treaty organization of non-communist governments, to share and own this satellite system. 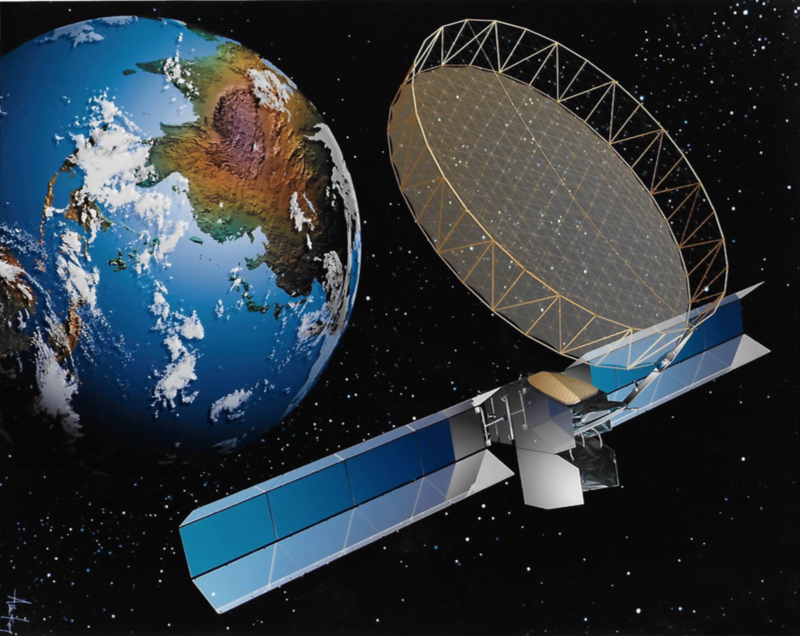 The treaty organization was named the International Telecommunications Satellite (INTELSAT). Each government would authorize their overseas telecommunications operator to subscribe to and take membership size depending upon the amount of international traffic conducted by that country. INTELSAT provided the means for all member countries to plan the amount of circuits needed between each pair of countries. INTELSAT would also procure the satellite but rely on the U. S. entity, COMSAT, for providing technical assistance in managing the procurement, deployment and operation of satellites. COMSAT represented all U. S. carriers that provided international communication and therefore became the largest shareholder, based on traffic, of INTELSAT. 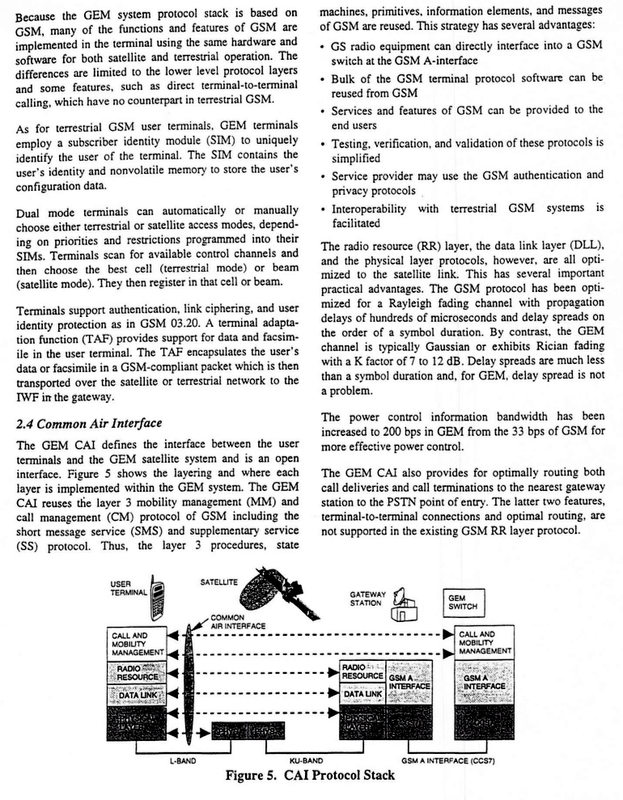 COMSAT sold stock to finance the building and deployment of the satellites before it was determined if INTELSAT would select either a Geosynchronous Satellite System like Syncom that had been built for NASA by Hughes or a Near Earth Orbit system like the AT&T Satellite System or the Relay Satellite System that had been built for NASA by RCA. 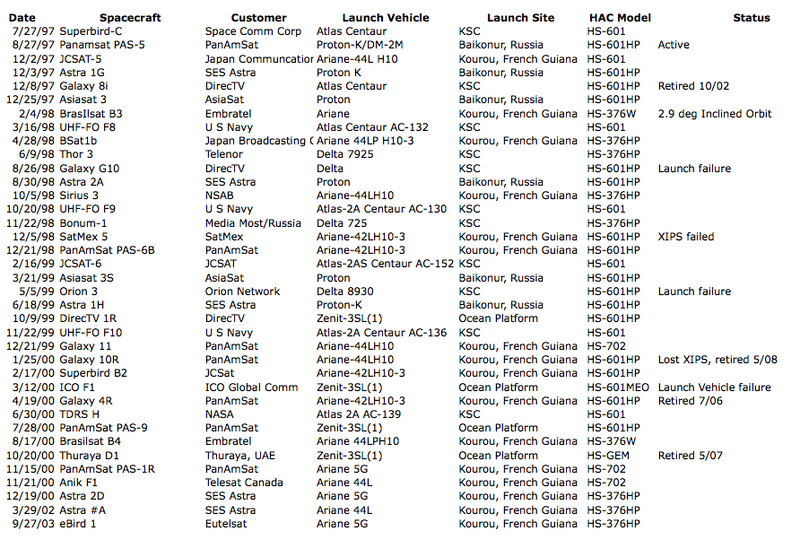 All of these events came together when Hughes was selected to build the EARLY BIRD Satellite for INTELSAT. The State Department announced it was inviting representatives from each of the member countries to send delegates to Washington DC for a Technical Seminar explaining Satellite communications with emphasis on how to procure a ground station to operate with the satellites and tie it into their existing overseas telecommunications networks. 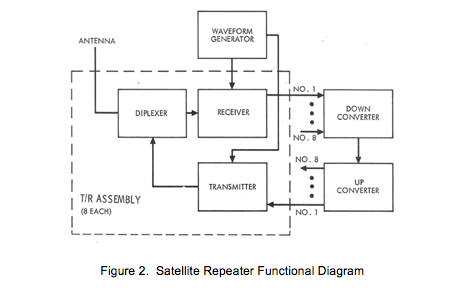 As I remember, it was April 1965 when this took place and every vendor pitched his ground station or supporting product around the figure of merit called G/T for a receiving and transmitting antenna system. Hughes International under the direction of General Shoup (USAF Ret.,) had been following the developments at the Department of State. Harold Rosen’s lab together with Dr. Begovitch and Mr. Brubaker, deputy and head of the Ground Systems Group were responsible for developing an antenna mount that would avoid the more expensive Polar or Azimuth over Elevation mounts used for Astronomy, Radar and other applications that required movement to track an object in space. 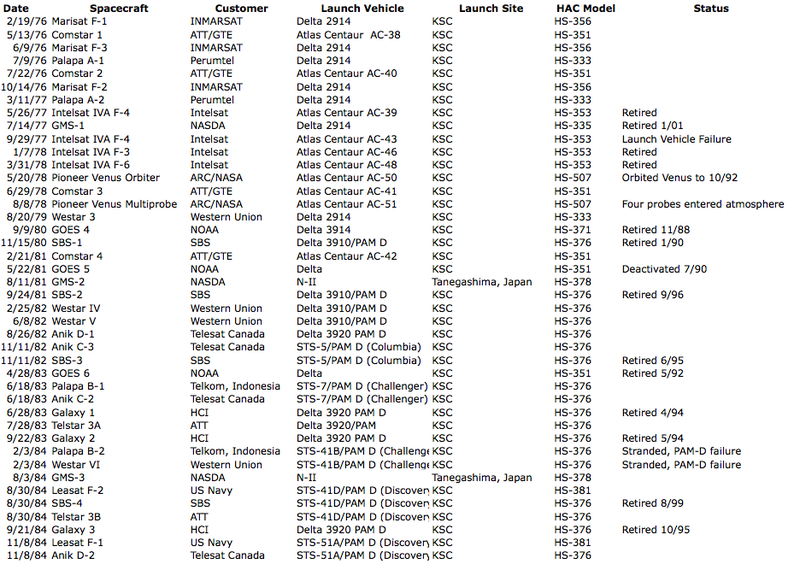 With a geosynchronous satellite system, these expensive mounts could be eliminated. 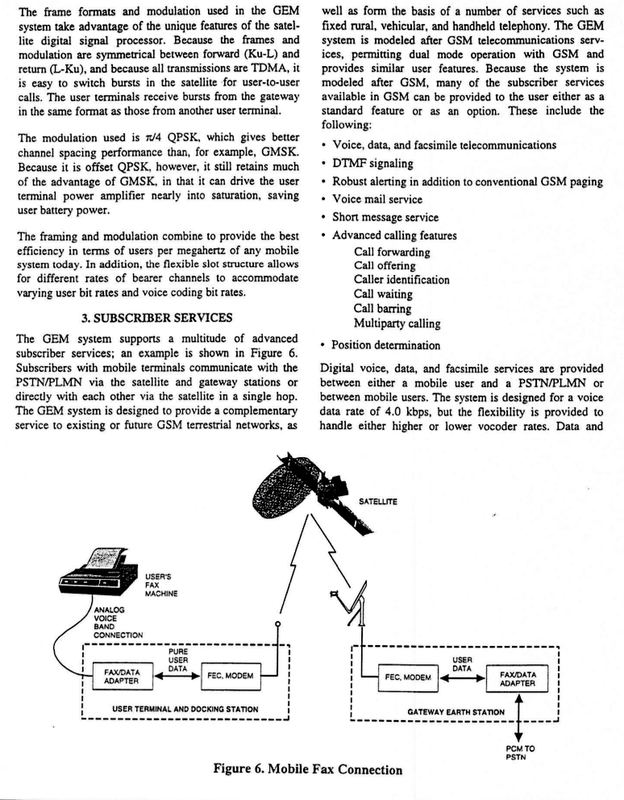 The resulting development was a simple and less expensive “Wheel and Track” mount system for the geosynchronous satellite. 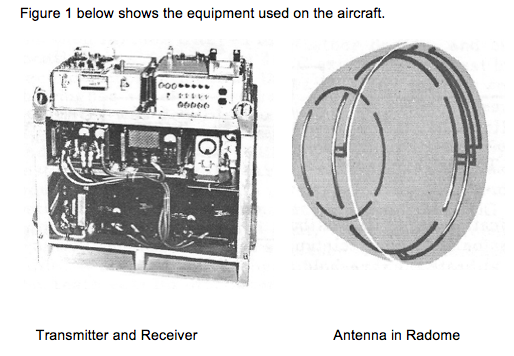 Hughes had something to sell that would enable the early acceptance of the geosynchronous satellite system. General Shoup’s organization earlier had established relations with Nippon Electric Company, (NEC,) to deploy the Hughes Air Defense System. NEC had developed new digital telephone switching gear and was looking for another market for this product. Dr Puckett and Mr. Roy Wendahl, executive VP’s were involved and a decision was made to form a new subsidiary joint venture company with NEC focused on the international telephone operating companies that would be customers for the INTELSAT system. It was decided to separate SATELCO, selling a commercial product from Hughes International, which was in the business of selling TOW Missiles, Air Defense Systems, radars and other defense electronics. General Johnson (USA Signal Corp Ret) was hired to be the SATELCO President reporting to Mr. Roy Wendahl, and to hire a Marketing VP with international commercial sales experience from outside the company. They selected Mr. Steven Barrie, a multi-lingual Swede by birth, but a naturalized U. S. Citizen with extensive international electronic marketing experience. Barrie was a gregarious, enthusiastic individual, who could win the attention of any roomful of personalities. He looked for people to fill the organization with carte blanche from General Johnson and Dr. Kobyashi, (CEO of NEC,). Carpeted offices outside of Hughes in a commercial office building were furnished with wooden furniture instead of ordinary “Hughes Steel”. He hired me as his deputy for coordinating with Hughes European Offices and the Middle East and African Market. Al Apodaca was hired to handle Central and South America and Gus Cano, from Peru, became the field representative working with Apodaca. Willie Kamei, another outstanding individual from Hughes International coordinated meetings with NEC and marketing opportunities in Asia. The technical staff consisted of Bob Scrafford from Harold Rosen’s lab and his deputy Jack Shaw. Joe Moore, Al Koury, Bob Walp, Ed Enriquez and several others were part of Scrafford’s organization. Scrafford led his group to design a lower cost antenna with Dr Nick Begovitch’s Ground System Group in Fullerton. 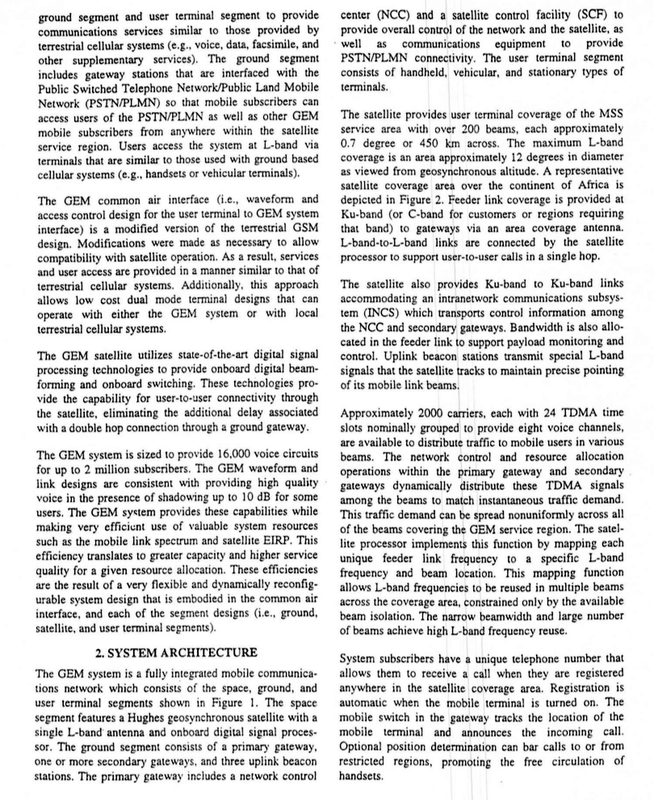 In addition, Dr. Sam Lutz from the Hughes Malibu Research Laboratories provided many technical papers justifying the use of the Geo-Synchronous system, the simplicity of the SATELCO antenna and won the minds of many potential customers for the adoption of this new concept in satellite global telecommunications. We were briefed on the upcoming April Conference at the Department of State and instructed to became acquainted with the foreign telecommunication delegates who would be our future customers. The U. S. Export Bank was prepared to make favorable loans to developing countries purchasing U. S. ground stations. Also involved were the international overseas telecommunication companies from Canada, France, Germany, Italy, United Kingdom and others I don’t recall. To support the State Department Conference, Hughes offered to fly delegates to Cado Gap, Arkansas where Hughes would install the first “Wheel and Track” mounted antenna and NEC would install their new state of the art digital switching equipment. Undoubtedly there were probably several reasons for selecting Arkansas. 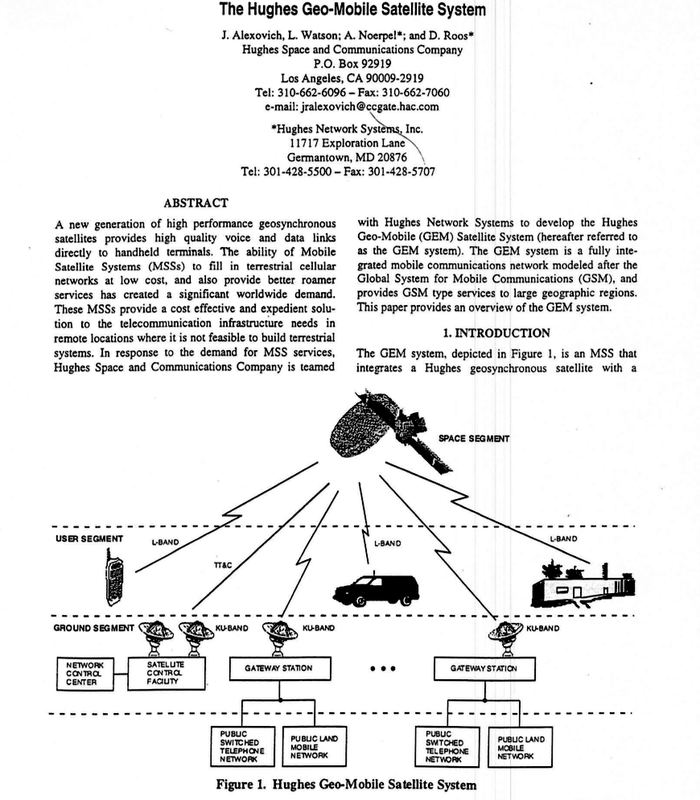 Primarily the Hughes/NEC decision to demonstrate in Arkansas supported the idea of a better technology in a remote location. The then current HF Radio systems for international communication that were located in major cities generally near a coast. Hughes participation in this demonstration, supporting the success of INTELSAT, furthered the goal of President Kennedy to demonstrate to the free world, the benefits of capitalism over communism. Following the events at the Department of State, Hughes chartered planes to fly any delegate attending the DC Conference to Cado Gap (near Hot Springs) for the demonstration of the first “International Telephone Switching” center in Arkansas. 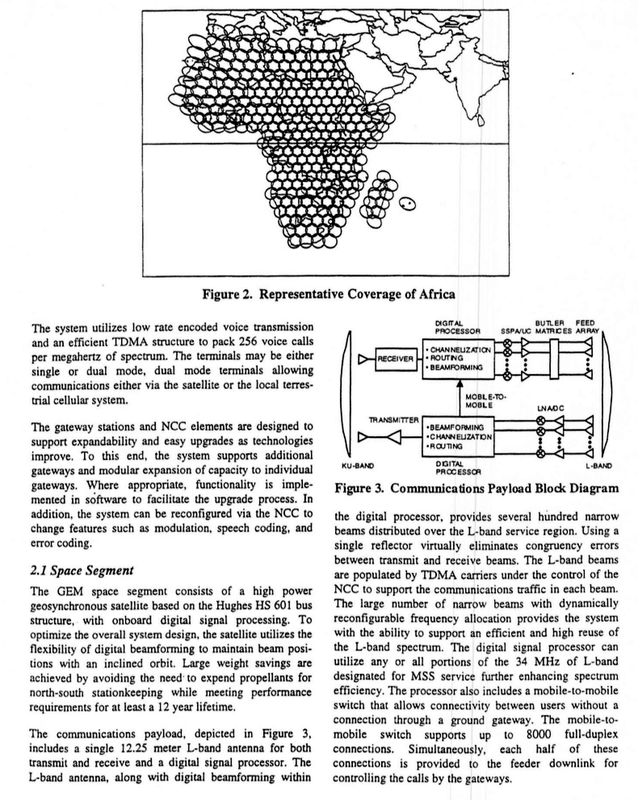 The point was that a satellite-switching center could be located anywhere in the world. The Arkansas location was a Hughes poke at the U. S. companies handling international communications like AT&T, ITT, Western Union, and RCA Globecom, relying on HF radio or undersea cable communication, that had made major coastal cities like NYC or San Francisco their operating centers. Because my hosting responsibility in Arkansas included Africans and Middle Easterner delegates, I was concerned about how to safely dine and entertain them in the strongly social prejudicial areas of Hot Springs. I was assured by State Department officials that restaurant owners and club owners were given the word to treat the visitors properly and that there would be lots of plain clothes State Police around to avoid any incidents. Hughes Corporate Staff planned an elegant affair that was quite impressive. The demonstration of “Wheel and Track” mounted antenna and the NEC equipment and the inspirational comments of innovation, and technology providing new opportunities for developing countries from the Hughes and NEC Executives were as exciting as a rallying political speech. At this point, the delegates were clapping and cheering the messages they heard. My delegates turned to me and said, I want you to come to my country and I will arrange all the meetings you need to make a sale! But the Cado Gap event was not over. The Arkansas Senators talked next. They graciously thanked this wealthy company from Los Angeles for bringing this expensive and impressive demonstration of the future and bringing these delegates to the beautiful state of Arkansas. They hoped the delegates would enjoy their time in Arkansas and assured them that they would be safe. Then they attacked Hughes as a company that used their connections in Washington D. C. to influence Defense budgets. They alluded to the fact that they believed Hughes was doing this to get favorable support from these Senators for a future Defense system. These remarks threw cold water on the images that Hughes had created. Delegates heard the message of influence and thought about what they had experienced under the British Post Office and French Cable and Radio. 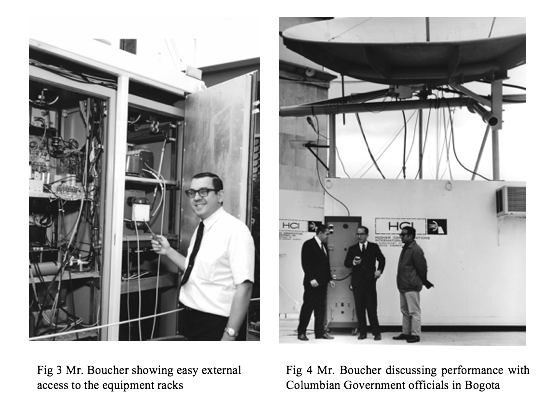 Puckett and Wendahl handled the criticisms with grace and concluded the event by being available during the demonstrations of the Antenna System and the Switching Equipment. As had been promised, the delegates were treated graciously and with friendliness by the local hotels, restaurants and clubs. There were no incidents and the next day, Hughes flew the delegates back to DC where they caught their flights and took their impressions back to their home countries. Each delegate got a token gift of a set of cuff links and tie clasp picturing the Early Bird Satellite and the SATELCO Ground System. Not long after the conference, General Johnson became disturbed with the free rein he had been given by Hughes management. Although Hughes and NEC financed SATELCO, the Hughes contributions came from Fred Adler’s Space Systems Division, General Shoup’s International Organization and by Nick Begovitch’s Ground System Group. They were responsible for accounting for these expenses. Johnson, a bit skeptical of SATELCO, wanted a goal and a budget – not an open checkbook from various entities within Hughes. He eventually resigned and Mr. Ed Sheridan, a former Aerospace employee that had been hired by Ground Systems Group, was appointed President. Ed accepted the job but he never had confidence that SATELCO would be a financially successful company. He did improve the technical content of our proposals and tightened the contractual terms that were being offered. Under Steve Barrie’s marketing guidance, the decision makers in the countries that were prime candidates for INTELSAT satellite communications became known to SATELCO. Local agents that were hired in these countries were either well connected to the decision makers or were current suppliers to the local PTT. SATELCO’s agents explained such things as the decision process in their countries, the politicians that wanted payoffs, and the activity of the competition. Using traffic data, SATELCO developed economic studies, and presented the results to the decision makers. SATELCO provided information to help the target countries prepare “tenders”. Technical representatives visited SATELCO offices in Los Angeles. They were impressed with the technology developed by Hughes, but they voiced their concerns that Hughes wouldn’t stay in the telecommunications business and be available to assist them in further implementation of a satellite system that could also be used for domestic communications. It soon became clear that the British and French had technical staff in each of their former colonies. These in-country representatives were advising the Minister of Communications of the risks involved in adopting a Satellite communication system and relying on Hughes (SATELCO) solutions. Apodaca and Cano reported similar concerns in Latin and South America. Like the European overseas operators, the U. S. overseas carriers wanted to protect their business relationships that were threatened by the INTELSAT system. Although NEC could have supplied all the highly respected telecommunications equipment required, the Japanese Trading Companies representing them were companies who handled all of Japan’s export markets. None were specialized in, or knew much about the telecommunication business. Uncertainties in how to proceed in these countries caused the procurement dates to slip. None wanted to be first. The European countries (UK, France, Germany and Italy) were the first to implement satellite communication by installing very sophisticated and expensive satellite ground stations by domestic manufacturers. Neither “Wheel and Track” antennas nor NEC switching equipment were achieving the customer interest that had been expected. The in-country SATELCO agents were pressing for payoffs but there was no interest on the part of Hughes management to be involved directly in any payoffs. (Thank goodness!) Some agents believed that if a sale was made, their commissions could be structured to cover any payoffs. Two and a half years went by without any sales. RCA Canada, UK and French manufacturers made sales. Talk of disbanding SATELCO was being discussed. Mr. Wendahl was more involved in the oversight and he appointed Mr. Waldo Neikirk to report to Ed Sheridan and provide financial and administrative oversight management to SATELCO. Steve Barrie was fired. It was clear that it was a matter of time before an honorable solution to dissolve SATELCO, satisfactory to Hughes and NEC, would be found. It was decided to put an all-out effort to win Peru, Brazil and Argentina. Paul Visher got involved, delivered the proposals and negotiated the offers. I felt it was time to find another job and left honorably having a very nice exit interview with Mr. Wendahl in 1968. He acknowledged that oversights that had been made in the formation of SATELCO. Joe Moore informed me that Peru, Brazil and Argentina proposals were bid as “loss leaders” with the hope that the amount of loss could be lessened by building all three together. This would eliminate separate crews making the installations during different time periods. The offers to Peru and Brazil were won. STS, an Italian Company that had a major earth station in the INTELSAT System was awarded the Argentinean contract. According to Moore, the Italian Government threatened to stop importing Argentinean beef if the Italian proposal did not win. According to Moore, SATELCO then proposed to “Unwin” the Peru proposal and give the contract to NEC. Shortly afterwards, HUGHES Communications International signed a contract with Brazil on the 22nd of December, 1967 to build the Brazilian type “A” earth station. A small group was formed to implement the contract. Bob Scrafford was head of the group assisted by Lloyd Ludwig. Lou Greenbaum assisted by Al Koury was head of the engineering department. This group was located on 2311 Utah Ave. in El Segundo. It is my understanding that Lou’s group began building and selling test equipment. Lou had done an outstanding job in building the TT&C equipment for Syncom and Early Bird. Like many others, I feel very grateful that I began my career with Harold Rosen’s Syncom Project. 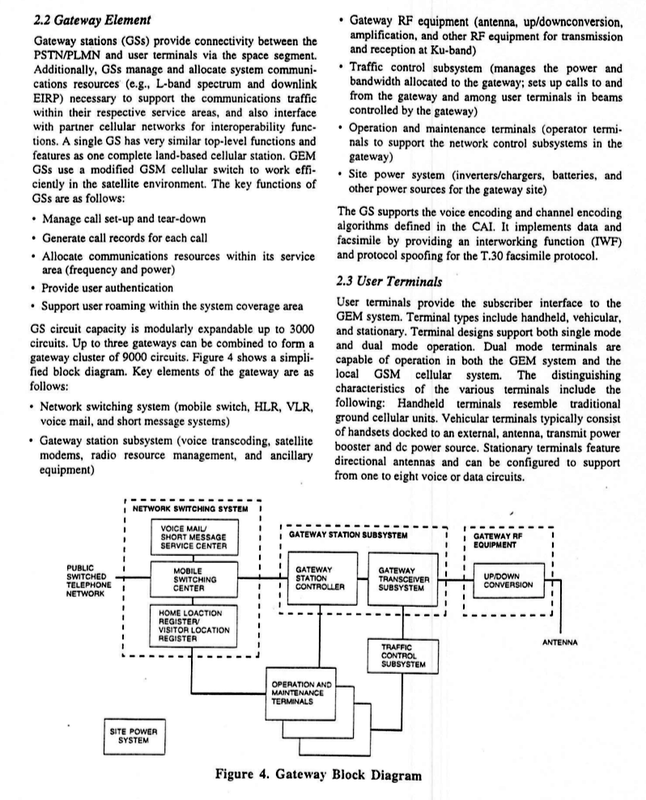 Syncom was a truly global system that led to many commercial, civil and military satellite based systems. 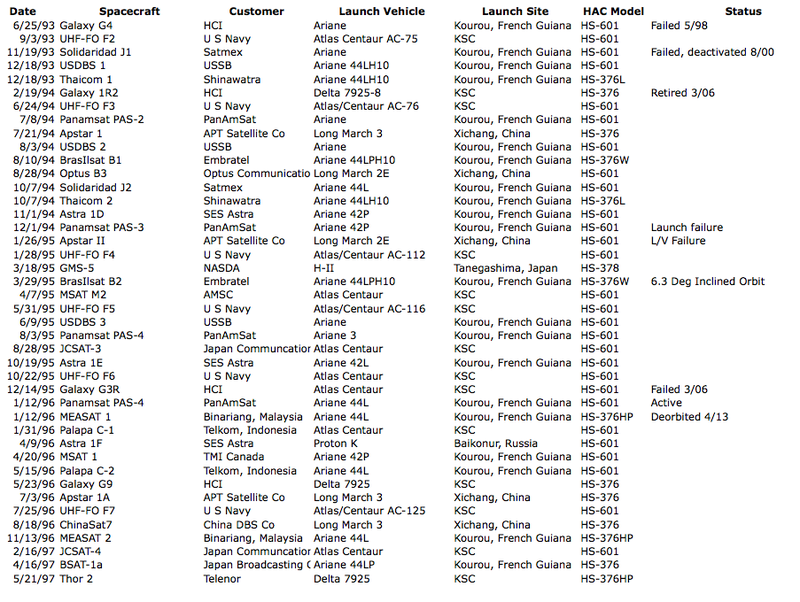 It has spawned many businesses and services that didn’t exist until satellite systems were deployed. Like many other individuals, I had the opportunity to get to develop these new businesses. Like Syncom and SATELCO, each had a set of risks associated with them. Some of these ventures requiring investment were successful like Syncom, and in others, like SATELCO, failed because of the political and establishment risks that materialized. But who can deny that the journey in the evolution of Syncom systems was of great benefit to society and that participation in the evolution and spin-offs was anything short of exciting, fulfilling, and satisfying through the association of many talented and dedicated individuals during a life-long career with this technology? I joined Hughes in mid June 1964 on the Masters Fellowship Rotation Program in the satellite area as my first rotation. Within a week or so another new hire named Mickey Haney showed up with an MS from MIT. 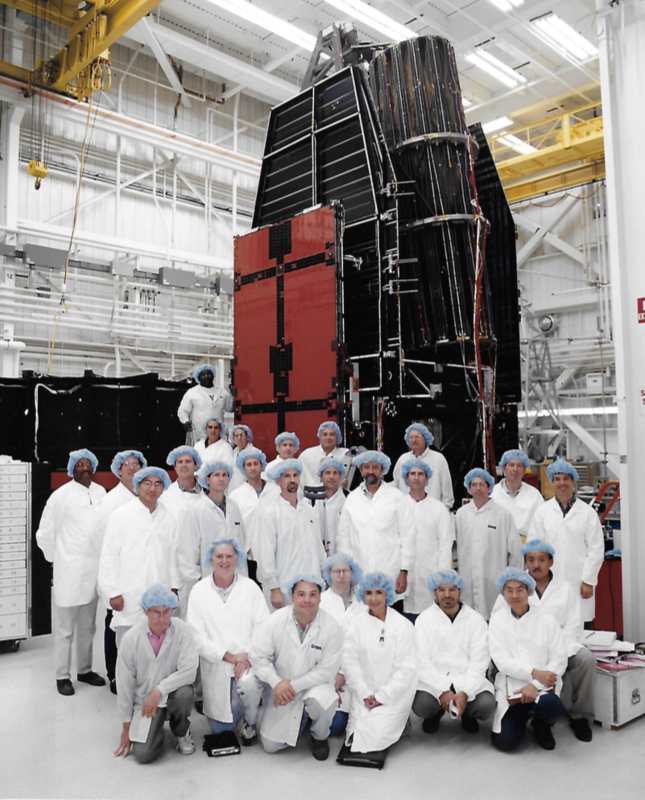 It was an exciting time to start at Hughes Space Division. The Earlybird contract was recently awarded as the world’s first commercial satellite program. Syncom II was successfully operating in orbit and Syncom III was about to be launched. As new guys Haney and I were doing a lot of calculations on ground station look angles (azimuth and elevation angles) as function of location relative to the satellite, as well as the satellite return look angles to the ground station. We also collected agreed-upon values of basic parameters like earth radius, geo-stationary orbit radius, and orbit equations for synchronous inclined orbits. As systems engineering people had need for different ground station locations, we ended up repeating calculations for each case. That led to a set of charts where one could read the satellite or ground station look angles for any location in the coverage region. These were the days of the slide rule for most engineers and no pocket calculators. Fortunately there was a time-share computer system one floor away where one could program in Basic to generate the data for these graphs. Charts for other geometric parameters quickly followed. We also learned about link budgets, the details of the various contributing factors in the budget, and communications capacity calculations. We made charts for many of those parameters. Clearly the work involved learning some basics of satellite communications. Soon another individual, Dr. Boris Subbotin, transferred from what had been the Hughes Communications Division. He was a senior scientist and in addition to his other duties he was given the task of keeping Haney and I productively occupied. Boris suggested that we compile a handbook on communication satellite parameters. It could be as simple as some content in a monthly industry trade magazine called Microwave Journal which usually had some graphs or nomograms in each issue, or a hardcover year end yearbook with a collection of technical charts. We started with a three ring binder version that could begin with modest content and grow as demand and utility needed. Boris recently stated that he liked the idea for three reasons: 1) he had no work to keep us fully occupied at the time, 2) he noted that most of the engineers in the area had their own private collection of notes, shortcuts, references etc. that they might share if a handbook was in the works, and 3) it would be a good learning experience for us. We thought it would be nice to have a catchy name for handbook, some kind of acronym based on words representative of the content. So we filled a blackboard with words like space, satellites, Syncom, communication, technology, data, tools, charts, information, reference, book, handbook, text, manual, etc. We made lists of candidate acronyms and in the end we selected one suggested by Boris. 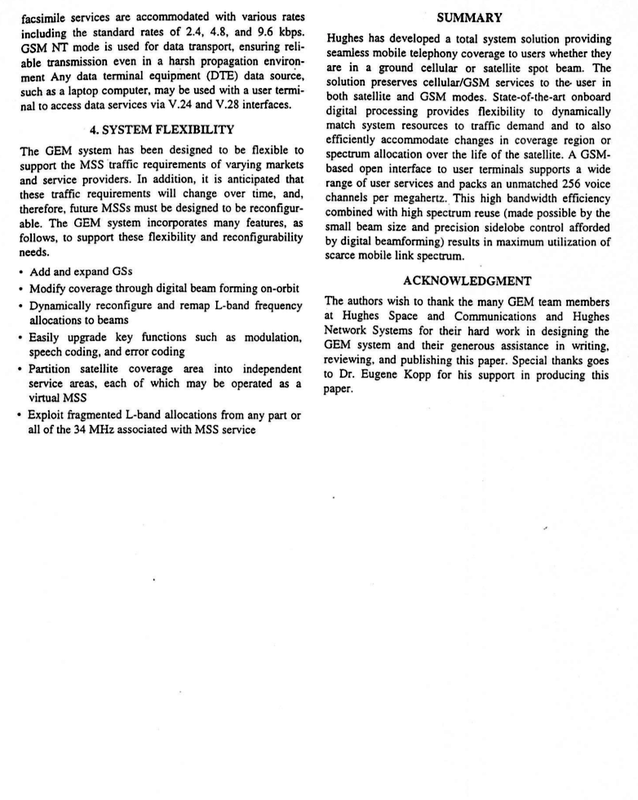 Thus the SMART manual was named with SMART standing for ‘Satellite Manual and Reference for Telecommunications”. We made up an outline and by Nov of 1964 issued an IDC requesting input for a handbook with four sections. Inputs came in over time, but nearly always needed some explanatory notes, at least for us new guys. We worked on this task part time during 1965, took what came in, and asked for help explaining it. It was reformatted if necessary and added to the handbook. By year end we had enough content for a first release. The publications people printed and assembled some 50 to 100 copies in three ring binders. We distributed these first SMART manuals with red bows just before the 1965 Christmas Holiday. People apparently found SMART useful not only for its content but also as a repository for their own favorite pieces of useful information. We solicited additional input and received material to be included in future updates. These were sent out every few years. Mickey and I eventually wandered off into programs or other assignments. The Systems Engineering folks in Leo Stoolman’s organization apparently took on the task of updating SMART, their first being in 1975. They also handed out copies to new engineering hires starting in the mid 70’s. Scientific calculators became available during the 70’s, but the manual was still useful. Equations were often provided with charts for those who wanted higher precision using the calculators. By 1980 the amount of new material accumulated was substantial and SMART needed a major overhaul. Marty Gale was given the task of reorganizing and issuing the updated version. Additional sections were added to the manual, which resulted in a rather hefty volume. A separate book was added consisting of satellite maps of Earth as viewed from geosynchronous orbit in 5-degree increments of longitude for a total of 72 Earth maps. Overlays were included to provide information on polarization angle, elevation angle, and coverage limits. During the 1990’s a simple plastic slide rule was designed and issued to replace the book of maps. It was compact, easy to use and also served as a useful gift to customers. Other reference materials (usually power point presentations) were generated by many departments within the organization as training material for new or old people. In some instances the company provided training to customer staff as part of the satellite contract. By the mid 90s there were probably two dozen well-developed departmental training packages. Computers were available throughout the company in this time frame. Many engineers developed their own tools for mapping (LEO, MEO or GEO), sophisticated link budgets including rain fade statistics, modeling of non-linear devices and Monte Carlo simulations of just about any kind of random event. Today these tools are called apps. In the 1990’s Macs and PCs were in wide use throughout Hughes S&CG. The use of software to create a digital version of SMART would offer the advantages of improved accuracy via direct use of the relevant equations, and portability via laptop or compact storage medium. However resources were not available at that time to support this effort. I personally used two small notebooks with 3.5 by 6 inch pages to house my portable SMART manual. In 2005 I arranged for a power point version of the SMART manual plus a large collection of the appropriate reference material to be included in Boeing’s knowledge management database project by Mike Whelan. The references were cited to give users knowledge of any assumptions or limitations on the use of the content. I retired shortly after the last update. Today employees can carry their SMART manual around on their (also smart) phone. It is remarkable that something simply started as a part-time project in 1964 would survive and still be useful 50 years later when updated to provide terchnically current content via technically current presentation media. Thanks for making this great site. I joined Hughes back in 1996 as a co-op student out of the University of Illinois. Though there were many employees that insisted that the golden days of the company were long past, my time there was really special and there isn’t a month that goes by that I don’t think about the great projects and people I got to work with before I left in 2004. Jim Thompson is one of those great people I got to work with and I love that he submitted a post about the SMART manual. I learned so much from that, much more practical than anything from my college education! And Jim downplays his little notebook. I will never forget being amazed whenever Jim would pull out his little notebook while we payload engineers were working proposal designs… he’d look at some lines in a graph and throw out some estimate of mass, power or cost… we’d take note and then go back to our offices to run a calculation in our, at the time, fancy excel workbooks, only to find that his quick and dirty assessment was pretty much spot on! Great times! Glad to see Jim is doing well! There is little doubt that several key available technologies in the 1958-9 post Sputnik era made possible the design and feasibility of the innovative and revolutionary Syncom synchronous communications satellite. One was the traveling wave tube, TWT (or TWTA). It is the device that provides sufficient radio frequency power in the satellite to be radiated by an antenna and be received on the ground. It consumes the majority of the DC power provided by a satellite and its batteries. 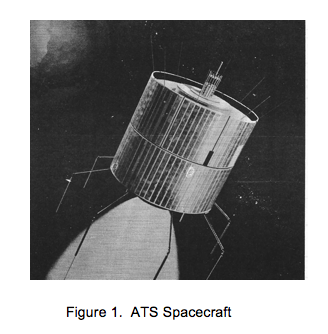 The evolution of the space TWT has been of major importance to all space programs since the pioneering Syncom and Telstar in the early 1960’s. There were, of course, several other technologies at that time that were essential to the Syncom concept. Included are solar cells, transistor technology, nickel cadmium batteries and the creative design breakthrough of a spinning body with axial and radial pulse jet control (the Don Williams patent). 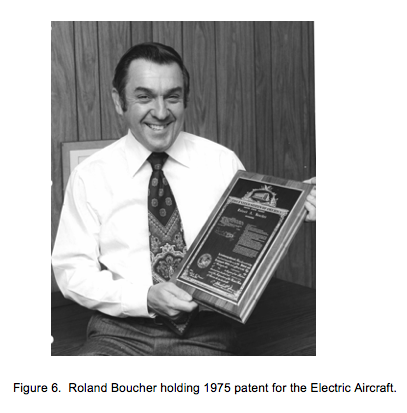 However, it was fortuitous that Hughes was also doing research in microwave power devices because of its core business in airborne and surface radars and missiles. The Research Laboratories (HRL) located in Culver City at the time, under Dr Andrei V Haeff, was the primary Hughes center for TWT developments. The evolution and design of the TWT had taken place in many steps and places over the previous quarter century. The US centers were primarily RCA, Bell Labs, Stanford University, and HRL with several other lesser players also spanning and post WWII. The major contributors were Haeff, Nils Lindenblad, Rudolph Kompfner, John Pierce, and Lester Field. John Mendel of HRL (my classmate at Stanford) was responsible for the Syncom tube development. Some consider the TWT as the purest realization of the microwave generation principle in electron tubes. Further, it still employs the most challenging technology amongst microwave tubes** necessitating both Swiss watch precision and launch vehicle ruggedness. If a narrow focused electron beam is sent at a speed slightly faster than a signal through a long coiled wire (delay line) in an evacuated tube, electron beam energy is transferred to the helix wire and signal amplification will occur. Electron beam design, generation, focusing, containment and collection, signal coupling in and out, suppressing unwanted reflections and oscillations, power handling and cooling, efficiency, maintaining vacuum, and numerous other design, materials, and lifetime issues are deeply involved in long life TWT design. For Syncom, Mendel developed a metal tube envelope and used a series of small annular magnets for beam focusing resulting in a S-band tube of 2 watts output. 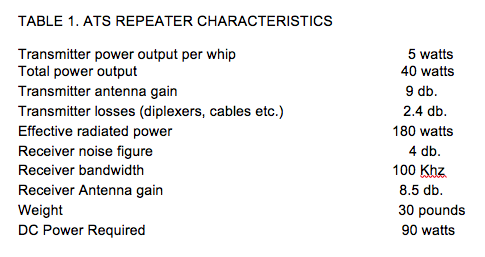 TWTs have benefits that allowed them to still be the predominant space RF power output devices of today. Their DC to RF efficiencies have climbed from a nominal 10-15% to 65-75%, the signal amplifications from 30db to 50db ranges, and RF power outputs from 2 watts to several hundred watts. 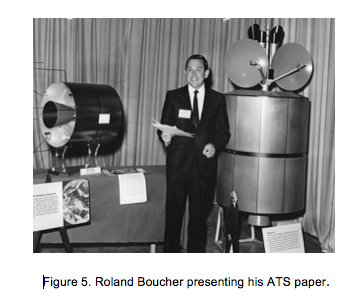 Parallel operation of TWTs for doubling output power was first used by Hughes on Intelsat II and is currently offered by suppliers. Since TWTs are not inherently coupled to resonant circuits, tubes may cover octave bandwidths. Today useful space frequency bands of operation encompass L, S, C, Ku, K, and Ka bands, from 1 GHz to over 40 GHz. Another beneficial characteristic is that they can be made low noise devices and used for receiving signals. Even just now, DARPA has issued an industry invitation to develop the next generation of TWTs. The total number of satellite TWTs in orbit today approaches 25,000. In orbit tube failures are still improving and have been minimal, estimated at 2%, but may be governed by power supply failures rather than the TWT itself. Hughes former Electron Dynamics Division in Torrance, CA, now L3 Communications Electron Technologies, together with the French-German Thales are the dominant suppliers of today. Not much has been published by the Russian and other suppliers. The TWT is a remarkable device, selected with great insight, and continues to be an important part of our space heritage.